DeepVeer's Bollywood Reception: The *Looooo-ooooong* List Of Celebrity Guests We Spotted! 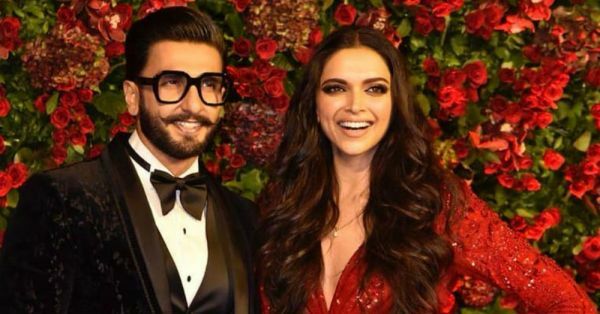 To compare Ranveer Singh and Deepika Padukone's to the Navraatras wouldn't be wrong. In fact, it's been more than 9 days - over 15 days to be exact - since the private DeepVeer wedding at Lake Como, Italy, on Nov 15. Of course, that doesn't mean we're not still as obsessed with the lovebirds as ever. The adorable newly-wed couple is making up for the small attendance at their Italian wedding by throwing a big Bollywood reception party at Grand Hyatt, Mumbai. ICYMI, Ranveer and Deepika arrived looking like European royalty, it was also their star guests who lit up the room. Yes, this DeepVeer reception red carpet saw Bollywood biggies and other celebs in abundance and we have the list. Here's the lowdown on who was there and what they wore. 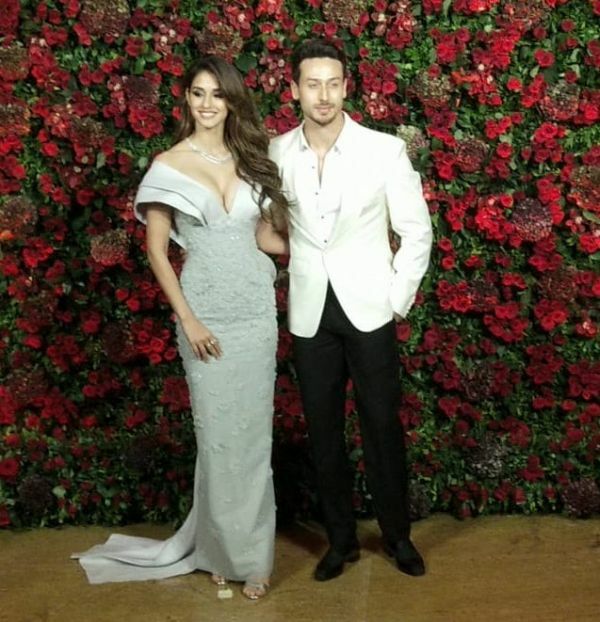 The couple looked incredible, with Disha in a grey plunge-neck gown and Tiget in a white and black formal suit. Bollywood actor Sanjay Dutt was there with wife Manyata Datta. 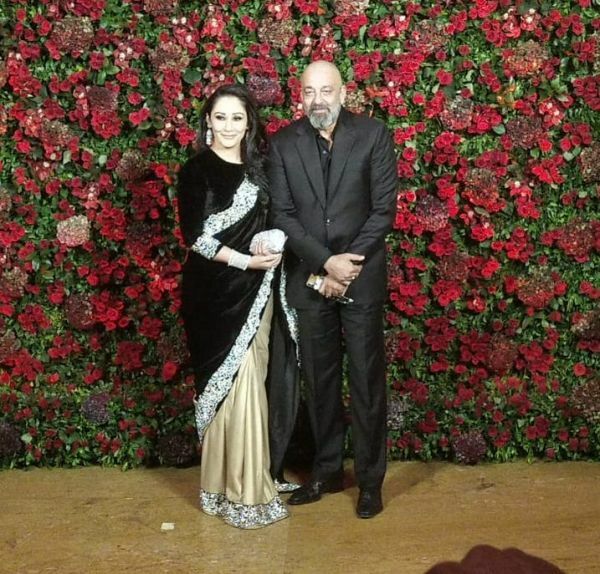 While Sanjay wore an all-black suit, Manyata wore a black and gold saree with a velvet pallu. 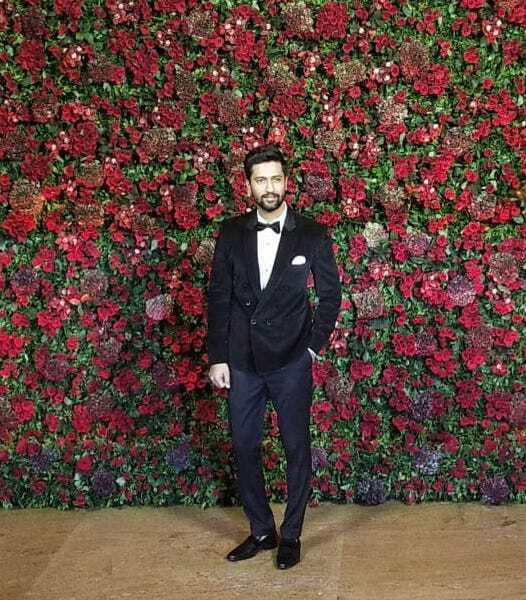 We can't take our eyes off the dapper Vicky Kaushal in a black velvet tuxedo. 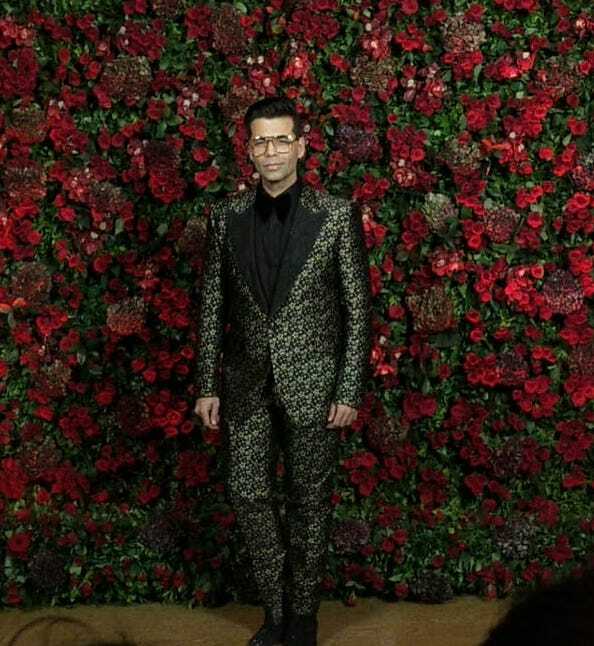 Bollywood director and friend Karan Johar gave us outfit goals, like always, in a retro black and bronze tux. 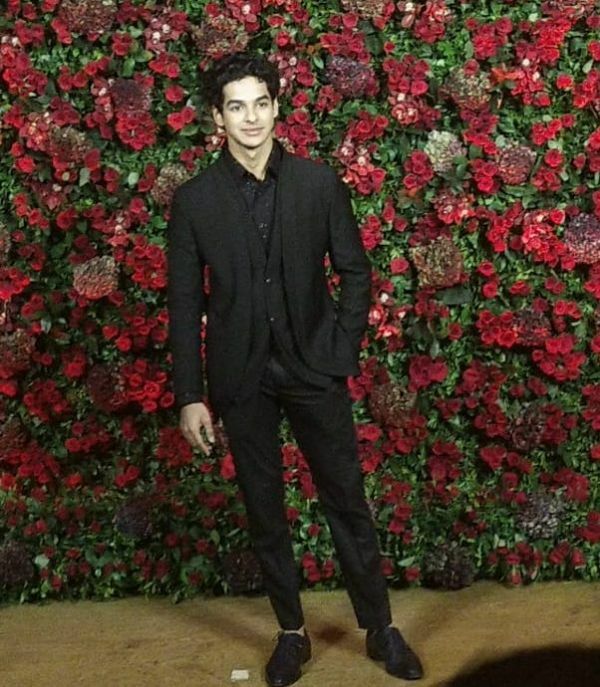 Ishaan Khatter cleans up nice, huh? The Dhadak star also wore an all-black three-piece suit. 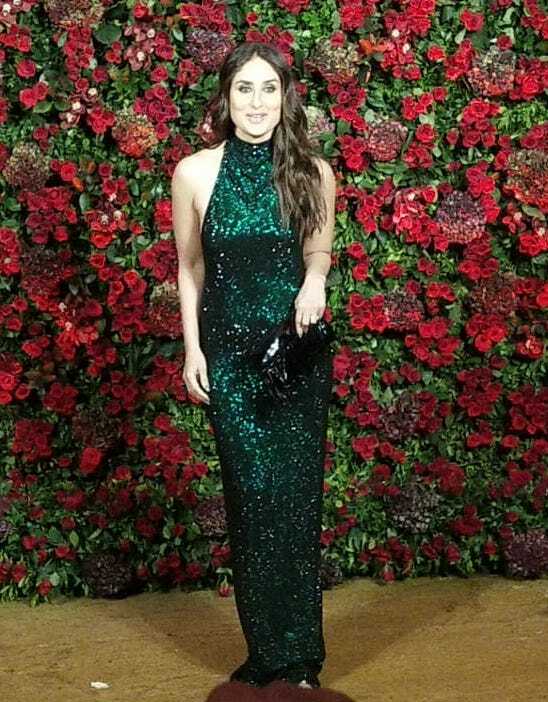 Kareena Kapoor Khan looked ravishing in a glittering emerald green gown with a halter neckline. 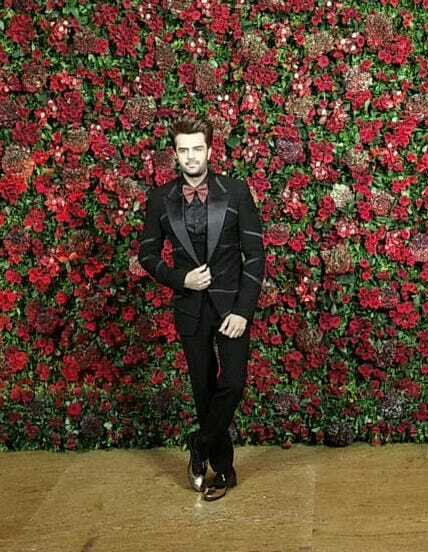 Looks like black was the colour of the night! Radhika Apte looked as chic as ever in a delicate black saree. 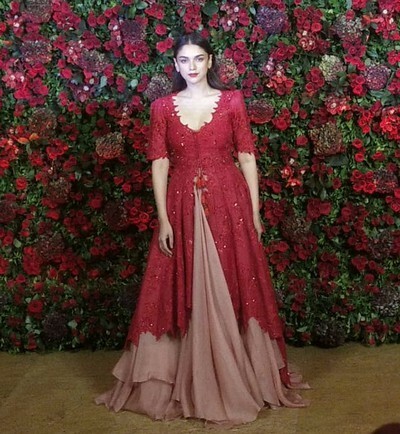 The lovely Aditi Rao Hydari put on a red embellished anarkali and a blush coloured layered lehenga. 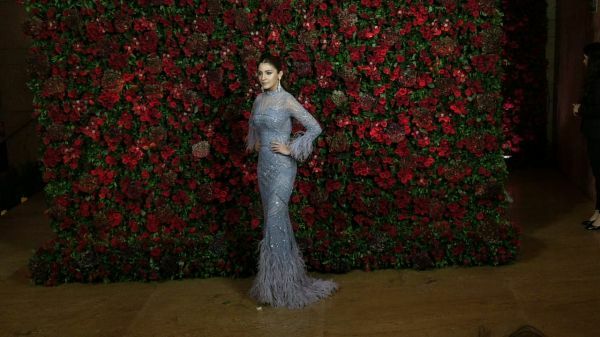 Sara Ali Khan sparkled in an embellished silver dress. Kalki went grunge-glam with a sheer black tee, layered with a white pantsuit. The Bachchan family looked picture-perfect on the red carpet. 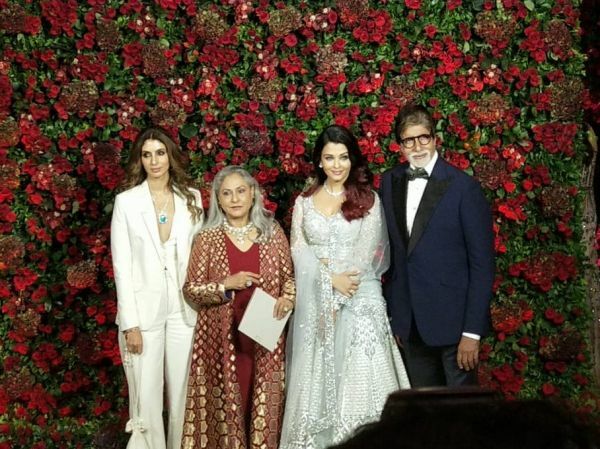 While Aish and Jaya wore Indian ensembles, Shweta and dad Amitabh wore pantsuits. SOTY 2 star Ananya Pandey looked like a real life princess in an ivory pearl-embellished strapless tutu dress. 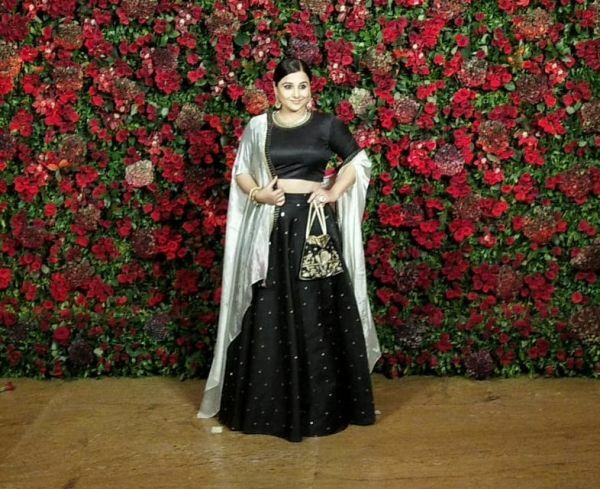 Vidya Balan's balck and silver lehenga choli looked chic and yet festive. As always, Jacqueline Fernandez nailer her party look, this time in a silver and gold embellished saree. 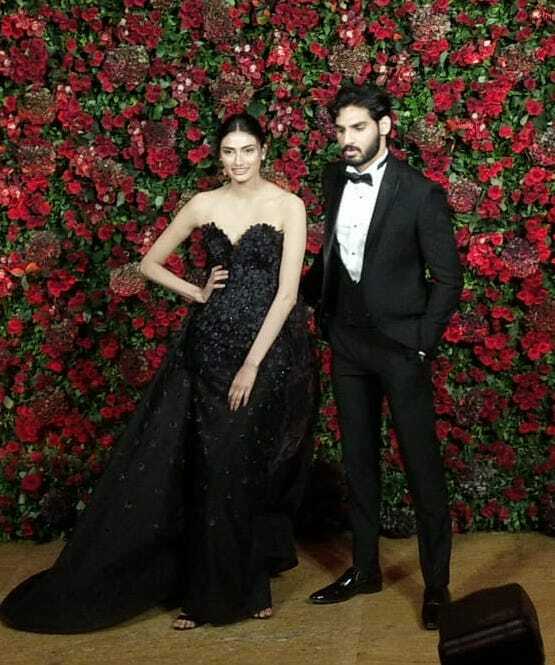 The siblings decided to twin in all-black outfits - Athiya in an embellished black gown and Ayan in a black tuxedo. 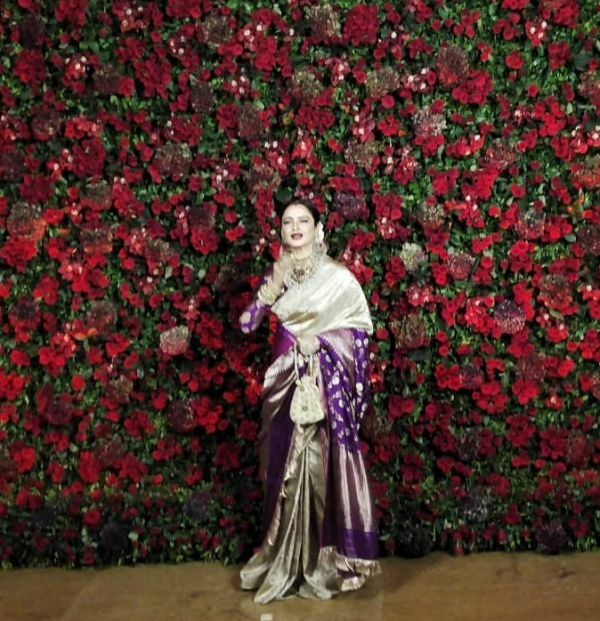 Bollywood veteran Rekha looked respendent in a purple Banarasi saree. 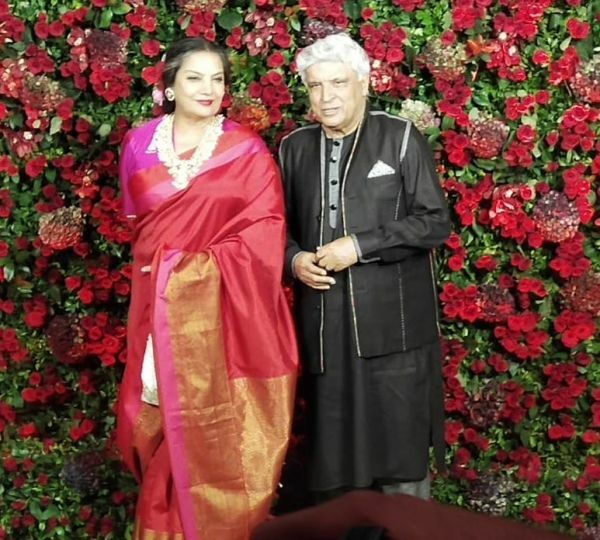 While Shabana Azmi coloured it up in a bright red-and-pink combination, her lyricist and composer husband Javed Akhtar stuck to a simple black kurta ensemble. It was a champagne coloured faux-fur detail saree for Bollywood actress Vani Kapoor. 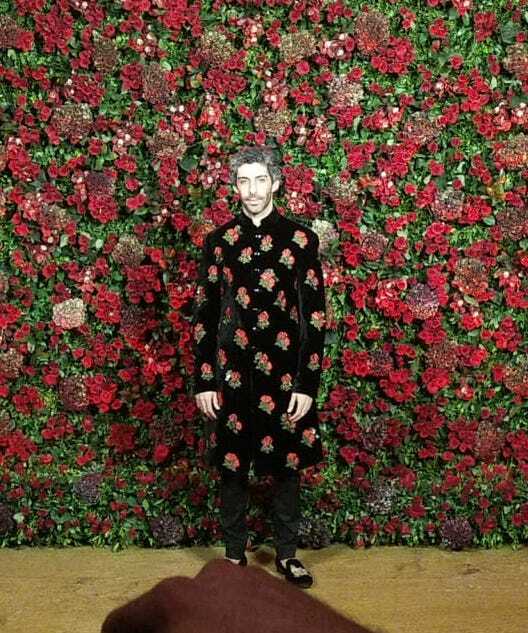 Jim Sarbh arrived in a black floral sherwani and matching pants and we love it! 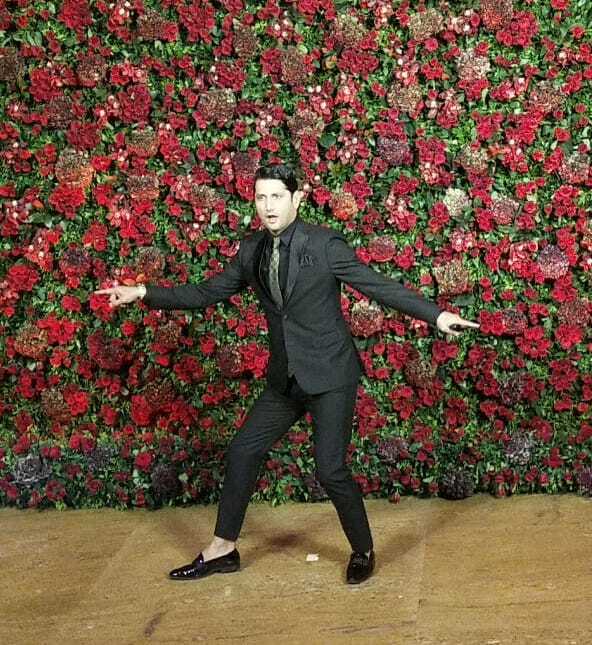 Bollywood actor Ali Faisal dressed to the nines in a three-piece suit. 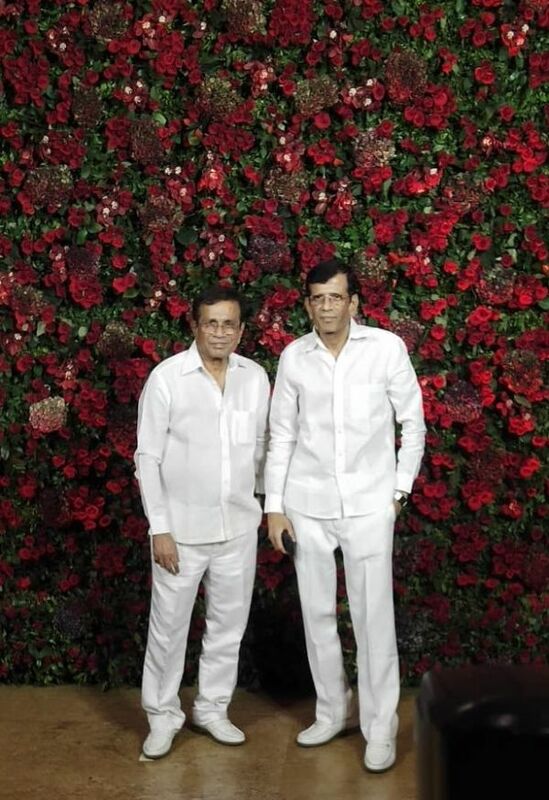 The director duo was in their signature white for DeepVeer's reception. The 'God of cricket' was there with his wife and son. 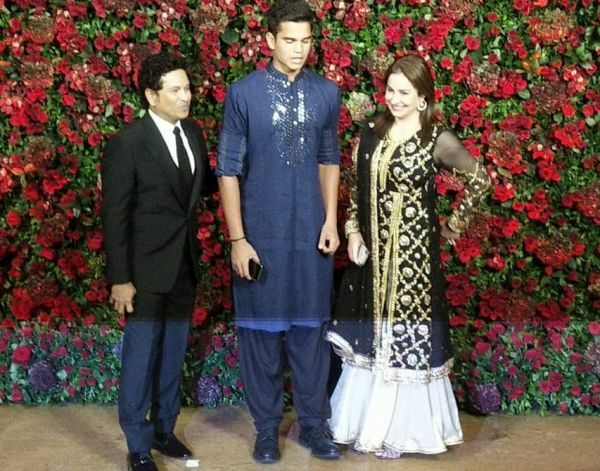 Sachin was also in a black suit for the evening. Nainika, who has dressed Deepika for multiple events in the label she owns with her sister, Gauri & Nainika, was there too. 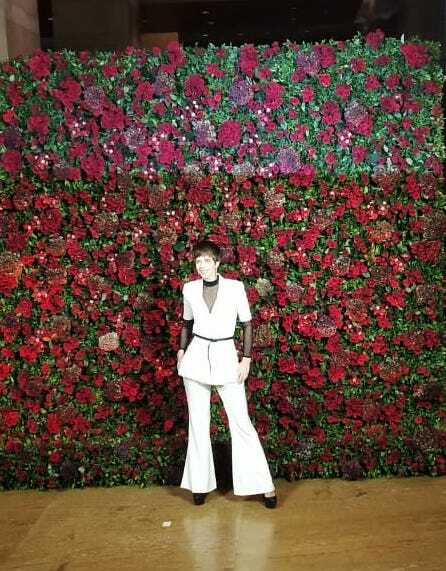 She worked a ruffle-on-ruffle look in white. 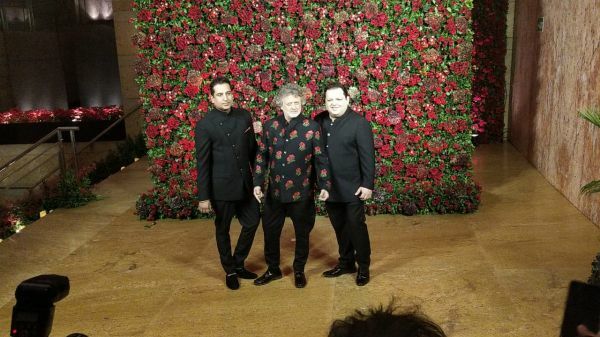 Designers who dressed Ranveer- Rohit Bal (for his Bangalore reception) and Rohit + Rahull (for this reception itself) were there too. Choreographer Marzi looked handsome in a black suit and gold tie. 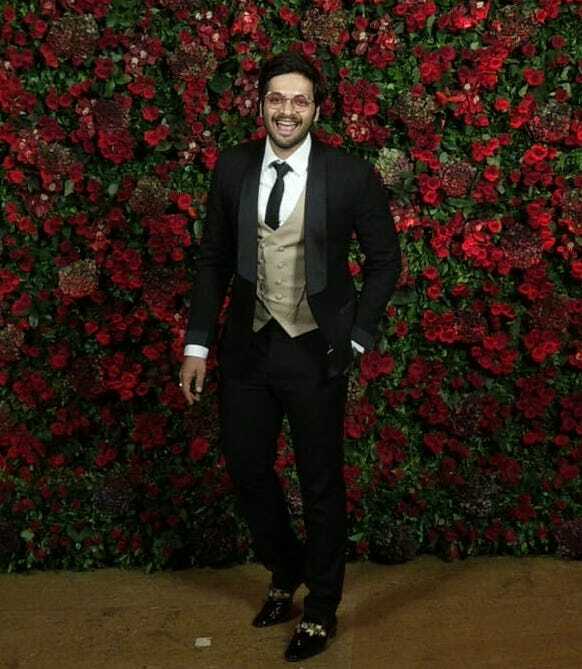 The TV actor and show host attended in a black tux and metallic shoes. Singer and actor Sophie Choudry attended DeepVeer's reception in a gorgeous grey saree. 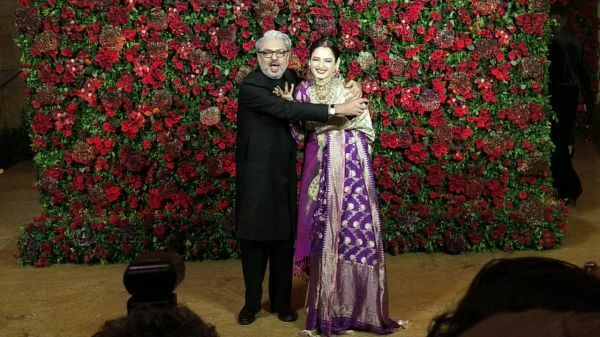 Deepika Padukone's "main man" Sanjay Leela Bhansali rocked an ethnic all-black look and Rekha's purple and gold silk saree look was breathtaking. Actor and performer Malaika Arora owned the event in a blue Amit Agarwal creation. 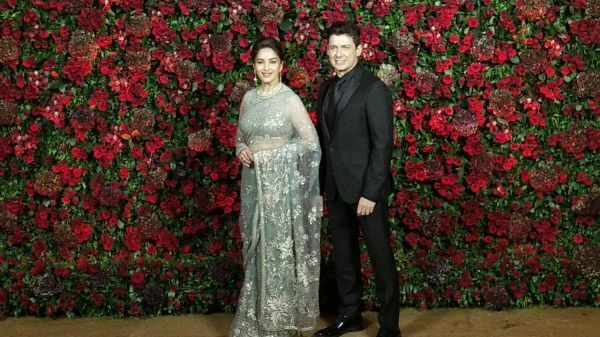 Madhuri Dixit Nene looked ravishing in an embellished grey saree alongside Dr Nene, who adapted a classic dapper look in an all-black outfit. 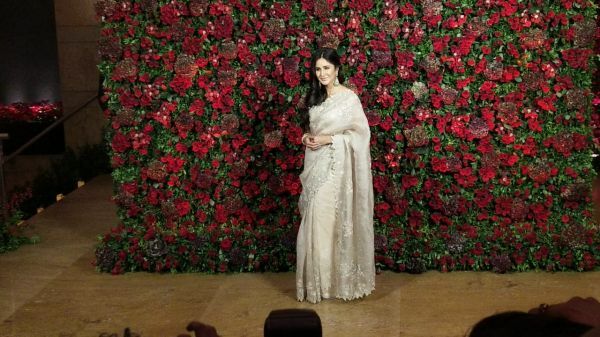 Bharat actress Katrina Kaif was also there at the DeepVeer reception and she looked like a vision in an off-white saree. 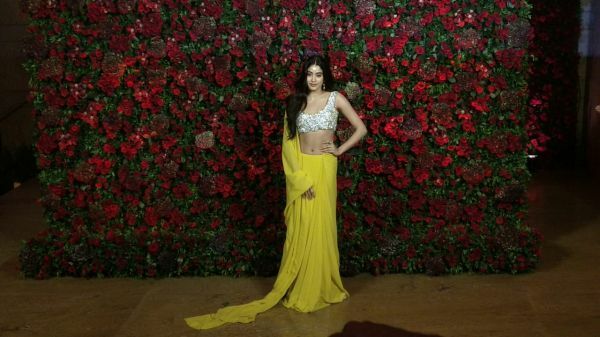 A lemon saree with an embellished blouse is one combination we won't forget, all thanks to the Dhadak actress Janhvi Kapoor. 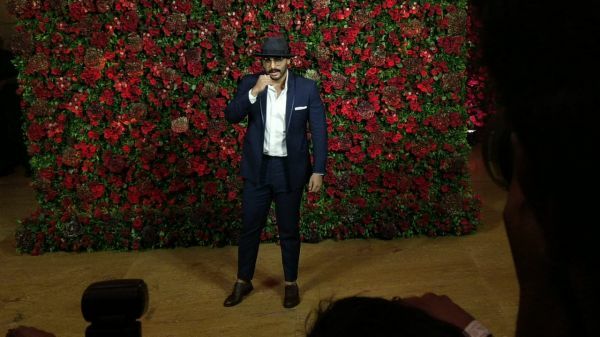 Dapper from the Kapoor Khandaan arrived a navy blue pantsuit and after seeing this look, it's safe to say that Arjun Kapoor knows how to rock a hat. 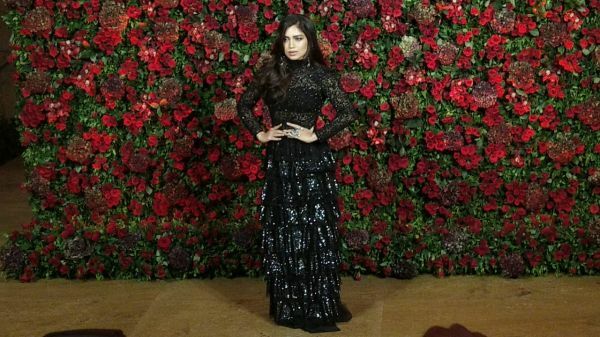 Toilet: Ek Prem Katha actress Bhumi Pednekar shined at DeepVeer's Mumbai reception in a black gown. 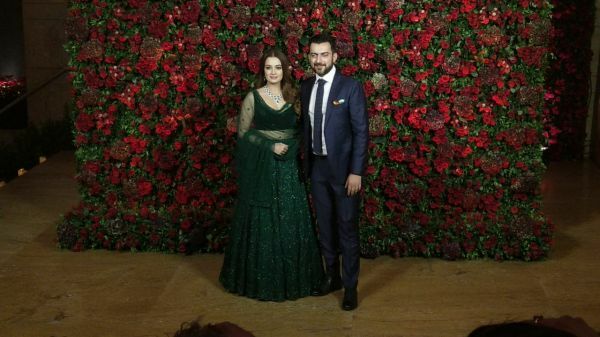 Dia Mirza and husband Sahil Sangha joined in the rest of the guest in a green lehenga and blue pantsuit. Yami Gautam arrived for the DeepVeer reception in a blingy beige gown. 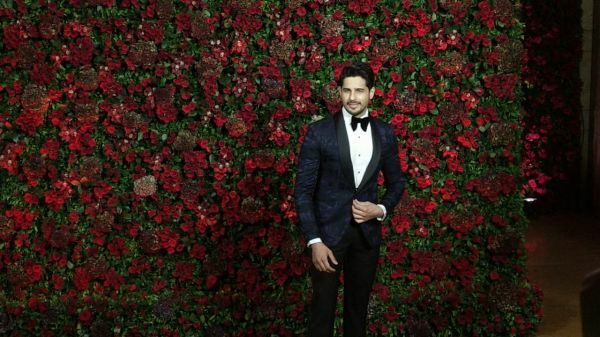 Ek Villian actor Sidharth Malhotra looked handsome in a blue-black tux. 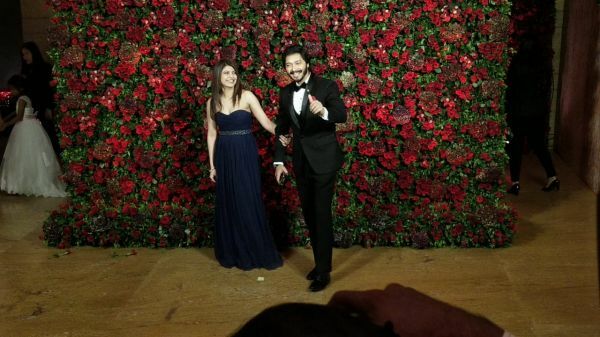 Shreyas Talpade attended DeepVeer's reception in a classic black tux. While Karan Kundra kept it classy in a black and white tux, Shilpa Shetty Kundra dazzled a golden gown. 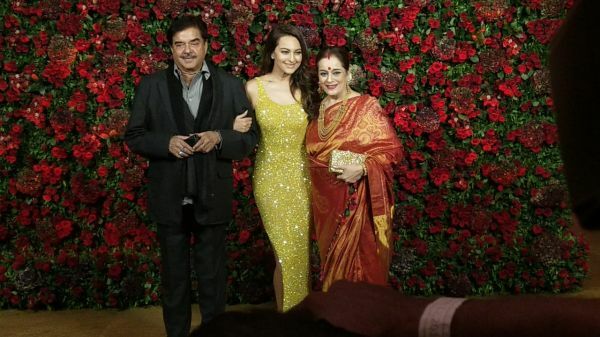 Sonakshi Sinha looked gorgeous in a lemon yellow outfit alongside father Shatrughan Sinha, who arrived in a charcoal grey pantsuit and mother Poonam Sinha, who owned her orange Kanchivaram like a queen. Dangal girl arrived in style wearing a black slip gown. 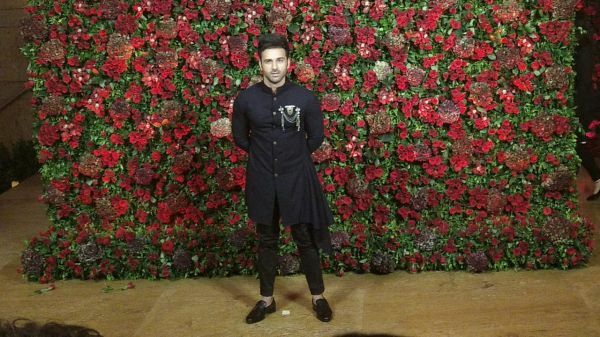 Pulkit Samrat wore a beautifully designed fusion ethnic wear with a stunning silver brooch. 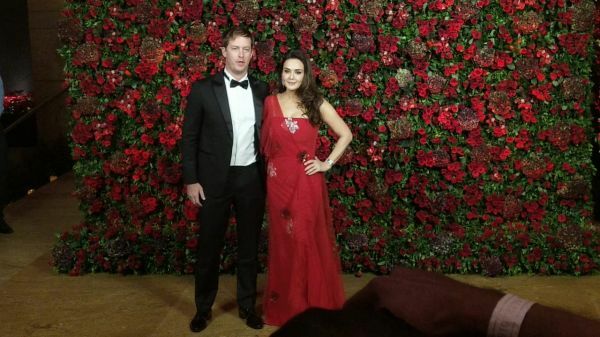 Preity Zinta was there in a red off-shoulder gown accompanied by her husband Gene Goodenough, who chose to don a black and white tux. 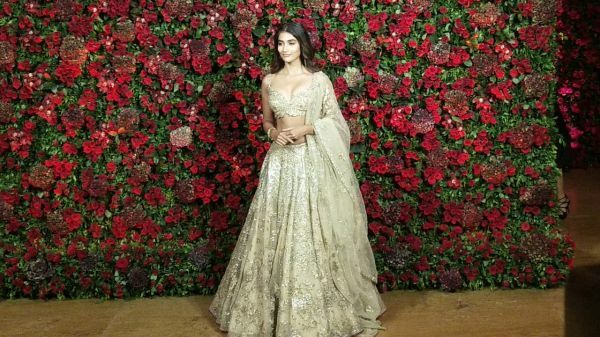 Mohenjodaro actress Pooja Hegde attended DeepVeer's reception in a cream embellished lehenga. 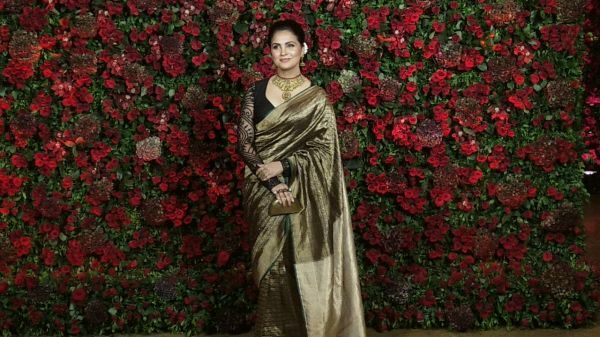 Doesn't Lara Dutta look like a vision in her black and golden saree? Love how she paired her outfit with a bun! 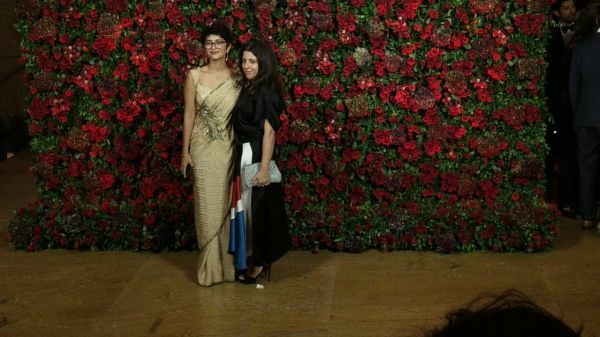 Kiran Rao and Zoya Akhtar joined the B-town gang respectively in a beige saree and a black gown. Karisma Kapoor stole the show in an all-black glittery gown. She paired it with a multi-coloured clutch. 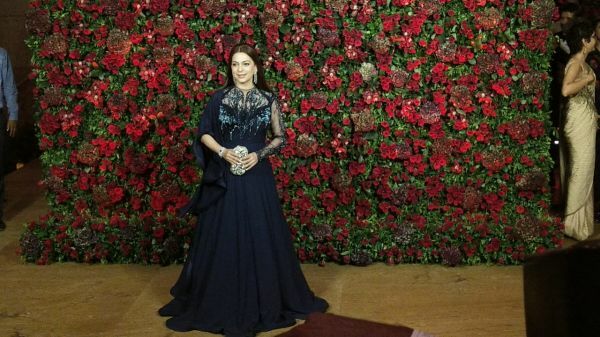 Juhi Chawla looked like a night fairy in a navy blue gown at DeepVeer's Mumbai wedding reception. 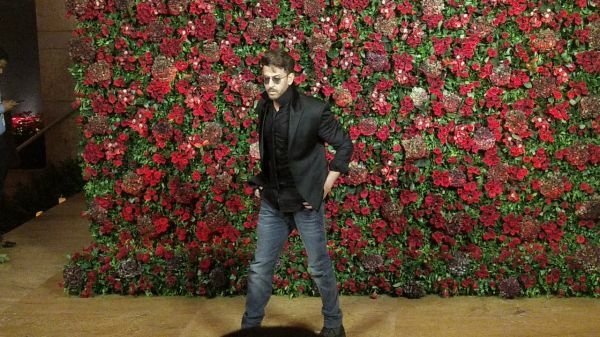 Hrithik Roshan is probably the only B-town actor who can rock jeans at a wedding reception. 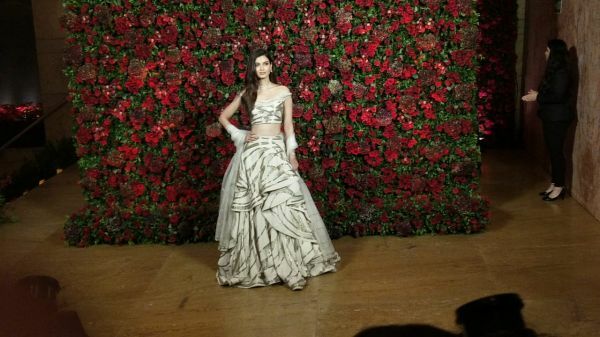 Cocktail actress Diana Penty looked gorgeous in cream and golden lehenga. 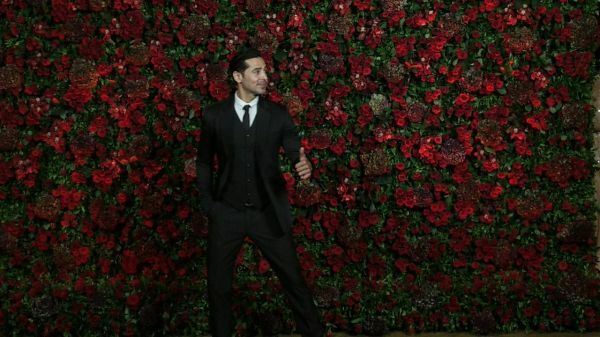 Dino Morea arrived in style wearing a black and white tux at DeepVeer's Mumbai reception. Actress Anushka Sharma looked breathtakingly stunning in a lavender gown. Looks like black and white tux were really popular tonight! 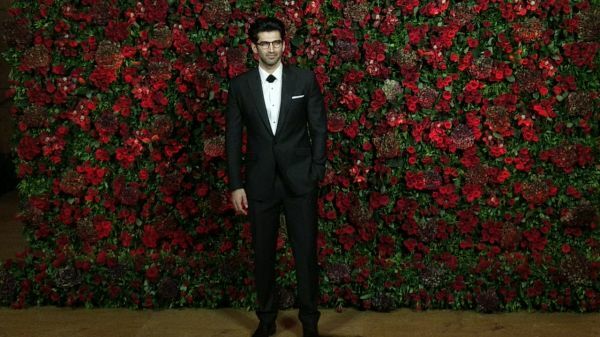 Aditya Roy Kapur joined the other B-town friends wearing a black and white tux. 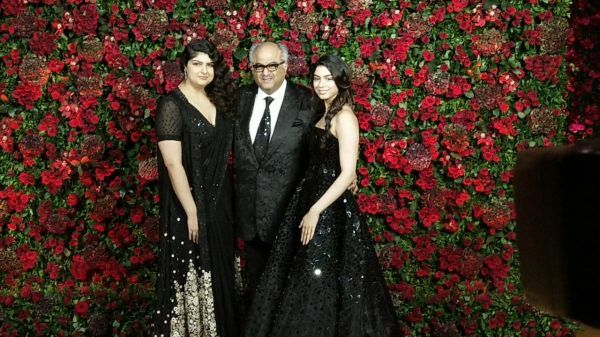 Anshula Kapoor and Khushi Kapoor looked stunning their black attires and perfectly complimented Boney Kapoor's black and white tux. 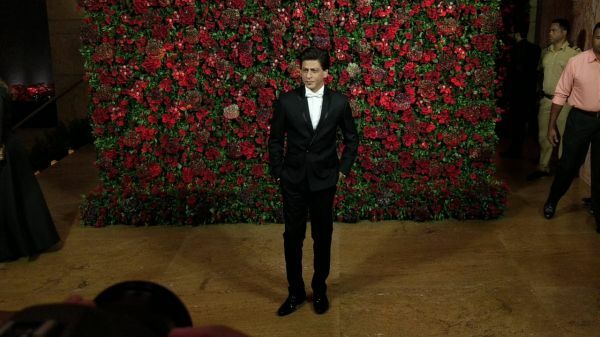 Badshah of Bollywood Shah Rukh Khan finally arrived at the DeepVeer reception in a black and white tux.